1 Cup Broccoli Boil or steam. 2 Cups Peppers Sliced Red, Yellow, or Orange. 3 Cups Skinless Boneless Chicken Cut up into small pieces. 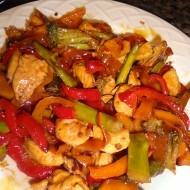 Cut up the chicken and fry in a pan with light oil or spray, and 1 tablespoon of Teriyaki Sauce. While the chicken is cooking, cut up the vegetables. Add the vegetables to another pan with 1 tablespoon of Teriyaki Sauce and saute until they are heated and saturated with the sauce. Serve the Chicken and Vegetables together on a plate or mix together and serve. Has been with us since 01/25/2012.